For some reason, this month seems to have become the month of motorbike covers. Just to go over the history a little then. My previous cover was one I bought at NAPS a couple of years ago based on the recommendation of a friend. I can’t remember the brand, but it felt thick, and seemed well made. Indeed it started out well, kept the bike nice and dry, but sometimes the local cats would sit on it, and scratch it, and chunks started to come out of it. It’s difficult to describe the material – it was like a thickly woven paper, a bit like the one-shot oil change overalls material, but several layers of it bonded together. After a year, I found it left a lot of ‘dust’ from the inside layers on the bike after putting it on and taking it off again, and finally after two years I’d decided I really didn’t like it, as now some of the seams were ripping, and some holes exposed the bike, so I planned to buy a new one. I could have gone for something from NAPS since it’s just down the road, but decided to ask around, and ended up getting a few suggestions from Jason Fullington, and after reading some reviews and thinking about it, I decided to order a cover from Nelson-Rigg – the Falcon Defender 2000 – through Jason’s company AFGMoto. As it was coming from the States, I expected it to take a week or two, but it made it within a week, and since I was looking to go to the AFGMoto shop anyway, I decided to drive on up there, though in a four wheel vehicle and in traffic, it took a little longer than expected – it’s just outside the Yokota airbase on Route 16, which is not a quiet road. In the meantime though, and in an odd twist, I went out on my bike for an hour last weekend, leaving the old cover neatly folded next to the conifer tree in front of our house, so it wouldn’t move, and when I got back, it had gone – yep, someone stole my old, hole-riddled cover in the hour between 9.30-10.30 PM. Fortunately the bike was only under a tarp for a few days. As you can see from the image below, the Falcon Defender is a rather tasteful black and silver. The black is a thick polyester weave, which feels very sturdy; the silver is a heat treat version of that. Unlike previous covers which had straps, this one has an elasticated skirting which I actually find feels far more secure, and should prevent flapping in the wind. Under the silver logo triangles are some holes to allow some venting, which the previous cover lacked, which I think was also an issue. It feels very good, it looks very decent too, so frankly I’m very pleased with it, and it’s far, far easier to get on an off. As a package, it also comes with a backpack to pack it in if you want to take it with you, or store it – something else I just couldn’t do with the bulky cover before, and actually something I’d want to be able to do. One minor issue for me is the eyelets for a bike lock are just a little too small for my lock, which isn’t a major issue, and they eyelets are re-enforced, which is nice. This may be more or less of an issue depending on where you live – I don’t think my old cover would’ve been stolen if it was on my bike. 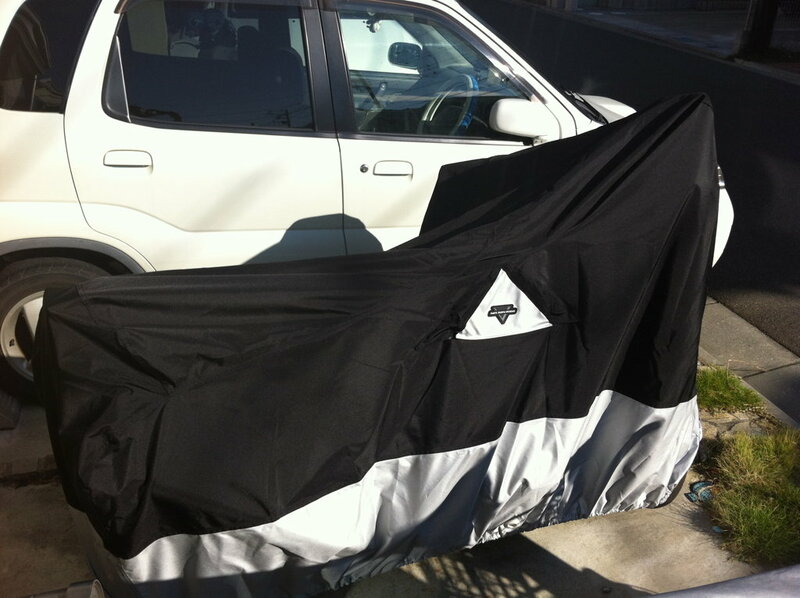 For sizing, buying from a US site for a Japan only bike was a little concerning, and from their sizing, it seemed a medium size would do, but I saw a couple of reviews which praised the cover itself, but advised going one size up, and I would agree – for my Honda CB400 Super Four, that’s a large size cover on there. The only downside is that the heat shielded material stops just short of the end of the exhaust, but I generally let my bike engine cool anyway before putting any cover on it. Price wise, given the exchange rate (Yen wins) and buying through AFGmoto, it was much cheaper than I think anything I could have gotten from NAPS, coming in under 7,000yen (though I picked it up of course), making that previous cover at 10,000yen even less of a deal.